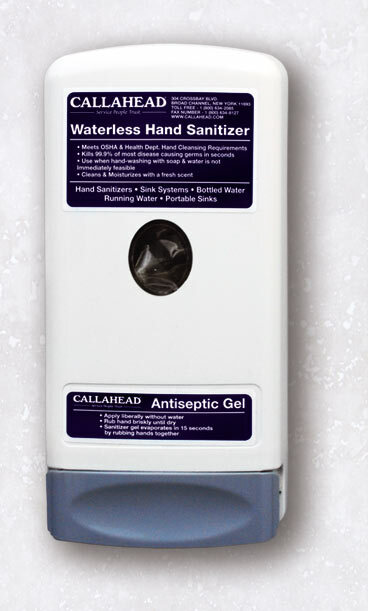 CALLAHEAD"s ANTISEPTIC DISPENSER is offered to accompany any of our portable restrooms with or without soap and water to ensure you have the appropriate hand disinfectant vital for every user"s protection. Getting rid of bad hand germs has never been easier than with our ANTISEPTIC DISPENSER. Hand sanitizer dispensers have become increasingly popular with the more educated the public has become on its benefits. Colds, flu"s, H1N1 and other common illnesses are spread through the transfer of germs through touch and through hand sanitation; you can significantly reduce the risk of illness. 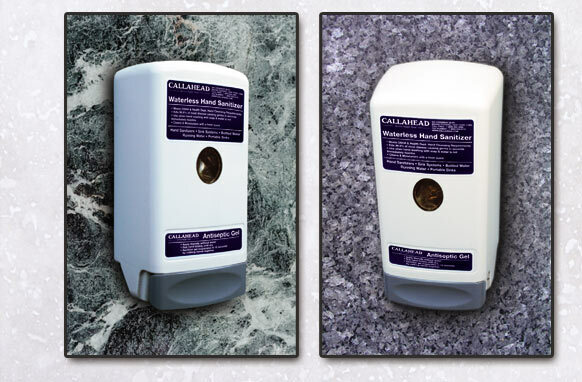 Installed and maintained by CALLAHEAD the ANTISEPTIC DISPENSER is an attractive white and gray dispenser with CALLAHEAD's navy blue signage that is quick and easy to use to achieve proper hand sanitizing. The antiseptic gel provided and refilled by CALLAHEAD, kills 99.9% of germs and bacteria that can cause serious illnesses. The ANTISEPTIC DISPENSER is beneficial in conjunction with our paper towel dispenser, both installed in your portable toilet to give the user the same advantages of disinfecting and drying hands as if using soap and water. Our ANTISEPTIC DISPENSER supplies added protection in our portable toilets, already equipped with soap and water for superior disinfecting ability. Publications by The Center for Disease Control (CDC) and The Occupational Safety and Health Act (OSHA) conclude that handwashing is proven protection from the spread of many serious illnesses. Presented with this information confirms handwashing or sanitizing equipment is essential for every construction job site or special event. Just a pump of gel and rub your hands together, our quick drying sanitizer will protect users from harmful diseases and infections that are commonly spread through hand-to-hand contact. CALLAHEAD, along with the CDC recommends that hand sanitizers or handwashing facilities are a requirement for every public venue such as, construction job sites, food venues, supermarkets, parks, birthday parties, farmer"s markets, carnivals, playgrounds, schools, daycare facilities, marathons etc. CALLAHEAD understands that every employer, event planner or host have an obligation to protect their workers and guests but don"t always have the time to focus on the details of maintaining hand sanitizing systems. CALLAHEAD solves the worry of our clients with hand sanitizing options to suit every situation to ensure a healthy working or event environment for superior hygienic protection and users will appreciate. CALLAHEAD being in business for nearly four decades gives our client"s confidence in our commitment of providing only the highest quality equipment and service available. Accept no less than CALLAHEAD for all of your portable sanitation needs. The Center for Disease Control (CDC) affirms, "Keeping hands clean is one of the most important steps we can take to avoid getting sick and spreading germs to others." • The Occupational Safety and Health Act (OSHA) require employers to provide adequate washing facilities for employees that work with contaminants that may be harmful. • The Association for professionals in Infection Control and Epidemiology (APCI) position, "Although people usually think that germs are spread through the air, the fact is that germs are most easily spread through HAND CONTACT." AND "One of the best ways to avoid getting sick or spreading illness is to wash OR to decontaminate your hands." • The Center for Construction Research and Training (CPWR) states, "Lack of cleaning facilities on construction job sites increases the likelihood of dermatitis, caustic burns from extended contact with wet cement, or acid burns from muriatic acid or other hazardous agents that come in contact with the skin, and infection." The result, additional workers" compensation claims. • The Center for Disease Control (CDC) estimates that 36,000 people die from the flu or flu-like illness each year, and another 5,000 people die from food borne illness each year. And your best protection from this type of illness is frequent hand washing. More accessible than sinks. • Reduce bacterial counts on hands. • Requires less time than hand washing. • Acts quickly to kill microorganisms on hands. • Less irritating to skin than soap and water. • No sink, no water, no rinse, no towel & no mess. • Meets OSHA and Health Department hand cleansing requirements. • Soothing rich emollients help to keep hands soft even after repeated use. 1. Make sure all organic matter is removed from hands. All visible organic matter (for example: dirt) should be removed from hands prior to applying waterless hand sanitizer. 2. Apply a dime sized amount of waterless hand sanitizer to the palm of one hand or use a waterless hand sanitizer wipe. 3. Rub hands together covering all surfaces of hands and fingers. 4. Rub until waterless hand sanitizer is absorbed. Mounted inside any portable toilet or portable sink system. • Large push button design for easy operation. • Regulated push tube system allowing for approximately 1,300 single shot uses. • Enclosed sealed dispenser to protect soap from contamination. • Sealed dispenser to assure no contamination of antiseptic gel. • No soap or water needed to kill 99.9% of germs and bacteria that can cause serious illness. • Maintained 100% by CALLAHEAD with antiseptic gel refilled as needed. • Available for daily, weekly or monthly rental.